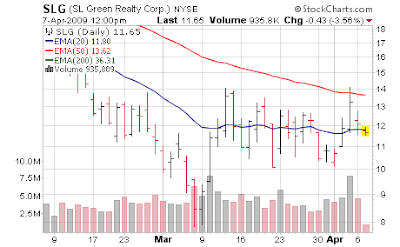 I am VERY gingerly stepping back into the short side in the basket of 5 commercial real estate stocks we hold. We just saw a short squeeze of epic nature and being a participant I am still looking for the teeth that were kicked out of my mouth. Again... gingerly. Of the 5 names SL Green (SLG) indeed has been the weakest (NYC office market party) - other than last Friday when "The Club" pushed up REITs it's been dead man walking. Working on finding my bearings - my bullish leaning going into the week based on key support levels being held was proven a false idol. S&P 825 is a pivot point for me; I would expect weakness below it and strength above it but thus far this week that has proven to be incorrect. There is such a disconnect between what I believe lies ahead for the economy and the rampaging bulls. After the euphoria of "we are seeing improvement over the worst readings in history" wears off, I am trying to figure out what the bulls will use next as a "stimulant". If bulls are going to clutch onto CEOs saying "we see improvement in the 2nd half" - I'd remind them that no one has a clue about the 2nd half; it's just guesswork. Very tricky environment and times like this make me savor when it seems so easy.